(07/12/2009 - 11:05 PM) atavist - uh oh... sounds like time to throw out a second hook... if you haven't already. (07/12/2009 - 11:12 PM) Lighthouse - Hold tight "redbopeep"! (07/12/2009 - 11:14 PM) redbopeep - I'm back...winds in the 30's...Ocean Lady (a cargo ship) draggin anchor just to the east...Aircraft Carrier #74 just came in from the ocean with a slew of tugs trying to keep her in the channel...oh this is ugly. (07/12/2009 - 11:15 PM) redbopeep - We're tight held but only about 30 ft from another boat alongside us to the east. They're tight too. (07/12/2009 - 11:17 PM) redbopeep - an empty boat lost its bow anchor when the first winds came up but the stern anchor was set. They just lost the stern anchor....they might be lucky and fowl on the anchorage buoy. (07/12/2009 - 11:17 PM) Lighthouse - Holding thumbs for you "red"! (07/12/2009 - 11:17 PM) redbopeep - Sad. We're anchored just off the USCG station--there is a USCG boat at the dock. They do nothing. (07/12/2009 - 11:18 PM) redbopeep - They didn't nab the buoy..darn! (07/12/2009 - 11:18 PM) Lighthouse - Keep us updated. (07/12/2009 - 11:19 PM) Lighthouse - Been there - and it's frightening! (07/12/2009 - 11:21 PM) Lighthouse - What wind strength now? (07/12/2009 - 11:22 PM) Lighthouse - And building? (07/12/2009 - 11:22 PM) Lighthouse - Oh damn! (07/12/2009 - 11:23 PM) Lighthouse - What "peak" is expected? (07/12/2009 - 11:24 PM) Lighthouse - What is windward of you? (07/12/2009 - 11:24 PM) redbopeep - David says "the anchorage is clearing out fast"
(07/12/2009 - 11:25 PM) redbopeep - We're in a good place. as far as that goes. (07/12/2009 - 11:26 PM) Lighthouse - Feels like I'm right there with you! (07/12/2009 - 11:26 PM) Lighthouse - After dark? (07/12/2009 - 11:28 PM) Lighthouse - Not much to break loose to your windward when it swings? (07/12/2009 - 11:28 PM) redbopeep - Nothing. That's why we're in this spot. We re-anchored to get here when we learned of the coming storm. (07/12/2009 - 11:29 PM) Lighthouse - Not much reading in your bunk for a while! (07/12/2009 - 11:29 PM) redbopeep - ha! yea, no reading. (07/12/2009 - 11:31 PM) Lighthouse - Anything else breaking loose? (07/12/2009 - 11:32 PM) Lighthouse - Got another anchor ready to drop if needed? (07/12/2009 - 11:35 PM) redbopeep - Our main anchor (all chain rode) 105 cqr is holding. Our backup 95 lb Danforth on deck with only our 600 ft of POLY 5/8" RIGGING rope to work with sad.gif but we do have 100 ft of 1" nylon rode attached to a 120 lb fisherman but that is below deck. (07/12/2009 - 11:36 PM) redbopeep - David will probably go out in a bit and rig up the danforth to the poly rigging line and set it ready to deploy. (07/12/2009 - 11:37 PM) redbopeep - oh, no....there's another boat coming in from the sea...they're going to anchor right in front of us....please let them go ELSEWHERE. (07/12/2009 - 11:38 PM) Lighthouse - Oh Jeez! (07/12/2009 - 11:40 PM) Lighthouse - Holding? (07/12/2009 - 11:40 PM) Lighthouse - That's good. (07/12/2009 - 11:40 PM) redbopeep - They're still sideways to the wind...hopefully they'll catch it this time. (07/12/2009 - 11:41 PM) redbopeep - they just caught. whew! (07/12/2009 - 11:41 PM) Lighthouse - Good! (07/12/2009 - 11:43 PM) Lighthouse - What wind do you have now? Settling at around 40? (07/12/2009 - 11:43 PM) redbopeep - Vessel Assist and San Diego Harbor Police have been HERE watching this go on the whole time btw. (07/12/2009 - 11:44 PM) Lighthouse - Maybe not much they can do in the middle of it. (07/12/2009 - 11:46 PM) Lighthouse - That's bad! (07/12/2009 - 11:46 PM) redbopeep - We don't have a motor on our dingy or we would have run a line out to him to try and bring him up to the anchorage buoys to tie off to. This has confirmed my resolve to get an engine sooner rather than later. (07/12/2009 - 11:47 PM) redbopeep - It is horrible to watch and not be able to do anything right now. (07/12/2009 - 11:48 PM) Lighthouse - You would need a pretty big outboard for those conditions. (07/12/2009 - 11:48 PM) redbopeep - Well, even a small one could have allowed us to get to and from his boat with a line. (07/12/2009 - 11:48 PM) Lighthouse - Your very fist concern must be your own vessel. (07/12/2009 - 11:49 PM) redbopeep - Right. Absolutely. (07/12/2009 - 11:50 PM) redbopeep - We are very happy with her performance right now and only wish that we had a few more things "take care of" like the nylon line...for example..
(07/12/2009 - 11:51 PM) redbopeep - Now the USCG is hailing Ocean Lady. This should be good. (07/12/2009 - 11:51 PM) Lighthouse - Be prepared fo anything if you can - and have the time to prepare things. (07/12/2009 - 11:52 PM) Lighthouse - On anchor? (07/12/2009 - 11:52 PM) redbopeep - Ha! USCG is asking if they're having proper anchor watch. Ocean Lady replies that yes, and engine is on standby. (07/12/2009 - 11:52 PM) Lighthouse - Good! (07/12/2009 - 11:53 PM) redbopeep - Captain of the Port requests that Ocean Lady keep the engine on standby. DA??? That was a CYA from USCG. (07/12/2009 - 11:53 PM) Lighthouse - She on anchor? (07/12/2009 - 11:54 PM) redbopeep - She is less than 1 of her boat length from the USCG station...she'd directly upwind of the USCG station. (07/12/2009 - 11:55 PM) redbopeep - She could take out the whole "fleet"
(07/12/2009 - 11:55 PM) Lighthouse - They'll be concerned alright! (07/12/2009 - 11:56 PM) Lighthouse - What time is it there? (04:08 AM) redbopeep - The only "incident" was really that no one responded to them and they could not move w/o a pilot. (04:09 AM) redbopeep - Well, enough of Ocean Lady...they are contacting insurance, etc, I hear on the radio. (04:12 AM) redbopeep - Then, woosh...the wind changed from 30 knots or so from the S to something huge (sorry pegged out ours and everyone else's knotmeter--I hear from another nearby boat that his pegged at 120. Everyone else's pegged at 100). We cannot confirm the windspeed. (04:13 AM) redbopeep - So, that was really high winds --around 100 knots maybe 120 knots--for a brief minute or so--it was very fast. (04:15 AM) redbopeep - The boat heeled over to port side...we sat with the rail close to the water. We have never been so heeled and I couldn't understand what was happening as we have no sails up--little windage. (04:18 AM) redbopeep - The seas were like a hurricane scene. I had no idea at the time that the wind was so high! Right before this sudden change David had started out the companionway door to the helm to just apply power to keep our position if need be. Immediately, we saw with the wind that the canoe (lashed down but only lightly) flew up 5ft and was sideways to the rigging. It held there and was full (FULL) of water on its side. (04:19 AM) redbopeep - A scene from a horror film with so much wind coming across the boat. I ran to the helm and David went forward to pull the canoe down. We thought he might just let it go into the water but we wanted to get rid of the windage before it caused us a big problem. (04:21 AM) redbopeep - I "managed" an even pull on the anchor chain as we shifted from facing south to west. As quickly as the burst had started it did stop and we heard a flurry of activity on the radio including a Pan Pan that a 50 ft ketch had broken from her mooring (just east of us) and any vessel in the area who could assist please do so. Unfortunate for them as everyone was just dealing with their own problems, I think. (04:25 AM) redbopeep - All 5 boats in our anchorage that held before still hold. (04:26 AM) redbopeep - but, we did lose one life vest that was stored under the canoe. (04:26 AM) redbopeep - That is nothing considering the things we saw floating in the water--someone lost all their cushions we saw smile.gif And shortly someone came thru the anchorage picking up these many things even in the winds. (04:27 AM) redbopeep - We heard on the radio that our friend, Thad, who has a wonderful century-old ketch Cloudia that he is working on in Mission Bay (on the hard) in a boatyard, lost his roof to his boatshed enclosure. We have not heard if Cloudia is OK.
(04:29 AM) redbopeep - We also heard that many boats had the same "lay down" experience that we had. Many boats that are very seakindly and have never had such things happen in their cruising. (04:31 AM) redbopeep - Now we sit in the charthouse trading off anchor watches. Fearful to leave for a minute as we sit directly west (in the West wind) of a lovely 42 boat that is only 20 ft behind us. We will not shorten scope for obvious reasons and they cannot lengthen scope as they sit a mere 20 to 30 ft in front of a 3rd boat...who sits just outside the USCG official "crash zone" for their helocopters so not one of our boats can lengthen scope or shorten scope or move. We all sit watch. (04:33 AM) redbopeep - Well, the skyline is lit wonderfully so we can see landmarks easily which is very nice. (04:34 AM) redbopeep - That passage came just 10 minute or so of sunset, btw. It was very strange. (04:34 AM) redbopeep - Enough writing...off to fix some dinner, It is 7:30 here and we're hungry. (04:35 AM) redbopeep - we pray for the safety of the remaining boats and hope that the 4 boats on the rocks are not totally lost. (04:36 AM) redbopeep - Yes, David reminds me...4 in our anchorage but many others along the jetty and elsewhere. (07:55 AM) redbopeep - All else is quiet except that our wind instrument is broken...it maxed at 60 while other folks maxed out higher. We didn't have the new airmar weather station hooked up, darn! so....now I don't know how windy it is. But, seems less so. (07:56 AM) redbopeep - The USCG takes the "gale" designator off at 10pm and we're back down to simple Small Craft Advisory thru sometime tomorrow. So, that is a relief. (07:57 AM) redbopeep - I hope some of you read this and enjoy the little saga. (09:03 AM) Lighthouse - So happy that you are safe. This whole saga can be read in the main Shoutbox window (link in menu at top R/H) - see "Archives". (10:06 AM) redbopeep - The latest official info that I have on max wind speed is that it hit 61 knots. My old indicator only goes to 60--and now its broke sad.gif so I know only that the neighboring boats saw 100 and more. I wonder...The front passage was very sharp -- really amazing. (10:07 AM) redbopeep - Clear skies for a few brief moments--we saw a beautiful red sunset before it all started howling from the west. (10:10 AM) redbopeep - When we lived near Corpus Christi Texas we saw tropical storms and one hurricane. These winds were nothing like the tropical storms...I truly believe they were over 100 knots for that moment of front passage. I have never seen waves and water look like that--not to mention that it really HURT to be pelted by the rain. (10:12 AM) redbopeep - As you may tell, I'm the anchor watch right now. That 42' boat hanging out about 15' on our stern (when we swing closest to them) is getting to be very stressful. (10:13 AM) redbopeep - Well, the wind is supposed to be dying down and shifting from NW to SE by early morning (daylight). (10:14 AM) Lighthouse - What is the time there now? (10:16 AM) Lighthouse - This whole saga can be read in the main Shoutbox window (link in menu at top R/H) - see "Archives". (10:18 AM) redbopeep - woops! (10:19 AM) Lighthouse - Long night! (10:20 AM) Lighthouse - What time will it get light? (10:21 AM) Lighthouse - It's back to about 40? (10:22 AM) redbopeep - looks like high 20's to me. But my personal "gage" may be off! (10:22 AM) Lighthouse - Oh! Not too bad anymore. (10:23 AM) redbopeep - no. I probably could go to sleep but worry that with the next wind shift we may have problems with the 42' boat behind us. (10:24 AM) Lighthouse - What is the state of the tide now? (10:25 AM) Lighthouse - Is there anyone aboard the 42 footer? (10:27 AM) Lighthouse - That helps. (10:27 AM) redbopeep - I imagine they are sitting up too--though I see no light. We are a big heavy boat just upwind of them. (10:28 AM) Lighthouse - Tide - is the sea rolling in? (10:28 AM) redbopeep - it is coming in but not bringing big current with it. (10:29 AM) redbopeep - It comes from the South, btw. The winds are from due west right now. (10:29 AM) Lighthouse - Coming over the breakwater at all? (10:30 AM) redbopeep - the breakwater would be the jetty I can't spell "zuninga" or something like that. Too lazy to pull out a chart! (10:31 AM) redbopeep - San Diego harbor is a natural bay and it is quite large--actually huge. (10:31 AM) Lighthouse - So really just the wind to concern you. (10:32 AM) redbopeep - yes, just the wind. really if we weren't so doggone close to that other boat I'd be in bed even with the wind. (10:33 AM) redbopeep - I know you probably wonder why we don't just re-anchor farther away, right? (10:33 AM) Lighthouse - Wonder if that ship will float off with the tide? (10:34 AM) redbopeep - Not this tide. 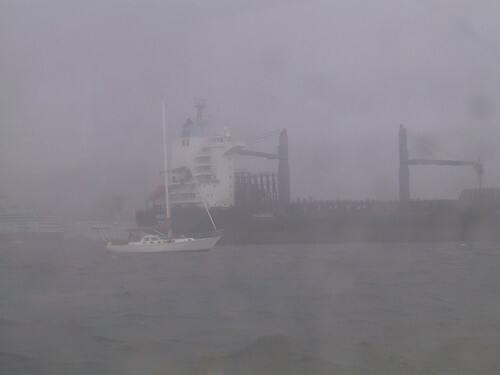 The ship went aground during a few feet higher tide. We will see the same on Thursday and higher Friday, Saturday. (10:35 AM) redbopeep - The 4 boats on shore must wait until then as well. I hope they are allowed to wait. (10:35 AM) redbopeep - Sometimes the Harbor Police force a salvage operation rather than waiting for tides. (10:35 AM) Lighthouse - Do you know if the 42 footer has more scope to let out? (10:37 AM) Lighthouse - Thinking of a wind shift. (10:37 AM) redbopeep - The third boat is too close to the edge of the anchorage to let out more scope. If he does, he will be in the USCG crash zone for their helicopters and they will make him move or fine him for being there. (10:39 AM) redbopeep - From NW thru to SE. We think it will go clockwise but don't know that from the weather forecast. We are scratching our heads about it. (10:39 AM) Lighthouse - Seems that the 42 footer has more potential problem. (10:40 AM) Lighthouse - Depends on what potential scope they have. (10:41 AM) redbopeep - yes. (10:41 AM) Lighthouse - You not allowed to talk to them on VHF? (10:42 AM) redbopeep - They have no handheld--so we yell back and forth to each other and flash lights to get attention. (10:42 AM) Lighthouse - And no handheld - crazy! (10:42 AM) redbopeep - They are lucky their solar panel did not blow away. They rescued it in the nick of time. (10:44 AM) Lighthouse - First lesson learned! (10:45 AM) redbopeep - You know we have been talking to many boaters around the harbor as things have been going on--all on VHF--alot of good info available if you have a radio. (10:45 AM) Lighthouse - Exactly! (10:46 AM) Lighthouse - However, they may be able to receive comms. (10:46 AM) redbopeep - Of course, thinking of equipment--I haven't even turned on the gps and plotted our position in the anchorage. Rather, I just keep checking bearings off of key landmarks. I'd actually forgotten I could use the gps for this! (10:47 AM) Lighthouse - If you're not swinging to much it's helpful - set anchor watch. (10:48 AM) Lighthouse - If you swing too much the alarm will be persistant. (10:50 AM) redbopeep - so the GPS anchor watch would be useful. (10:51 AM) Lighthouse - Well, it will then help a lot - particularly while it's dark. (10:51 AM) Lighthouse - Don't set it too sensitive. (10:53 AM) redbopeep - I just turned on the handheld GPS. The dark isn't too dark, btw. Half moon and many lights from the USCG station, the Ocean Lady is also lit up like a christmas tree....Strange things have been happening with the big ships tonight. The USCG has NOT closed the port, but yet they admonished the captain of a cruise ship for not "asking permission" to leave the port. They never ask permission--they just notify that they're going and they arrange for their own tugs, etc. (10:54 AM) Lighthouse - This whole saga can be read in the main Shoutbox window (link in menu at top R/H) - see "Archives". (10:54 AM) redbopeep - Shall I stop hogging the shoutbox, Lighthouse? (10:55 AM) redbopeep - The channel 16 traffic is pretty dead--that's a good thing. Things are going back to normal here. sigh. (10:56 AM) Lighthouse - No, not at all. Just if members are reading this in the small shoutbox window on the main page they may not know of the large window to see the bigger picture. (10:57 AM) Lighthouse - Keep posting. (11:00 AM) redbopeep - You know we could have taken the boat back down to Fiddlers' Cove Marina for this storm--she would have been on a fore-and-aft mooring and we worried that it was a lousy mooring and that we'd be better off on our anchor. What do you think of moorings in general vs anchoring? (11:00 AM) redbopeep - I must admit I have a weird fear of moorings for no reason. (11:00 AM) Lighthouse - It may be nice to copy/paste this all to a topic in the forum - after it's all over, so everyone can see. (11:01 AM) Lighthouse - The only time I ever broke away was from a mooring. (11:01 AM) redbopeep - Yes, how I babbled on all night--huh? (11:02 AM) Lighthouse - It was good to keep you company. (12:22 PM) magwas - I am happy to see you are OK.
Brenda, am I correct in understanding that the boats in the anchorage had some warning that a storm with strong winds was coming? That huge gust doesn't seem like it could have been forecast or expected, could it? When there are several boats anchored so close together I think that there is a greater level of anxiety. One is not only worried about their own boat, but has to keep an eye on the boat in front, and in back, of them. Tough to do. Thank goodness you came through it okay. Sleep well. San Diego has a very mild climate--though the Pacific Ocean has huge waves, the bay itself is quite calm and seldom sees big winds. Even when a gale is roaring a few miles offshore, the lee of Point Loma protects much of the bay from North and West winds. This storm was from the South. All anchorages in San Diego fare poorly with winds from the South. It was forecast that we would have gale force winds. We figured mid-30s with gusts into the low 40s max. Everyone knew the forecast was for those winds IN THE BAY but no one here really believes the forecasts because of so many false alarms and a history of such winds missing the bay. first, we had the Honda EU2000 on the aft deck. It was securely locked to the beefy boom gallows with a cable, but we'd have put it down in the cockpit in a more secure spot. Second, we only had the canoe tied down with its owner painters fore and aft. We carry it on top the car at less than highway speeds (45 mph) some times like this, but clearly we should have had it better lashed down. Luckily, I have a fear of flying inflatable boats and we deflated and packed away ours for the storm. Other thing I'd change is that we only had a short section of nylon rope as snubber on the anchor chain--it quickly stretched out (and stayed stretched out after the storm) and we should have had another snubber in place. Thank goodness that we did trice our bobstay (it is a running bobstay so can be pulled up and out of the way of the anchor chain which comes off a roller about 1/2 way out the bowsprit) as I think it would have chafed. Also, the staysail was not in a sailcover but rather just lashed to the staysail boom. I worried about that sail all night long as wind could get under bits of it though it was flaked down as tightly as it could be to the stay. I should have wrapped a tarp securely around it as I have not made the sunbrella cover for it yet. The mainsail doesn't have a cover made yet, but I wrapped the sunbrella purchased for its cover around it and secured it like a giant sausage so it was going nowhere. The gaffsail was not in place and jib below deck. Back to that Gust--well, yes the "event" was actually something that one could expect--just not the magnitude of it. We were expecting gale force winds only even though the info on the NOAA weather discussion about the coming storm the things that jumped out at us where that when the front passed with winds changing from South to West there would be a sharp shear. I am no weather-girl and didn't fully understand all but recall reading that there was a 140 knot jet carrying one system that would be intersected by the 60 knot jet of the other system (90 degree off axis) and the "event" of wind change would be "dramatic." It most certainly was "dramatic." If the boating community was listening to the WX VHF channel, they would be expecting milder weather of sub-gale winds and nothing dramatic about the shift from S to W winds, though. Have you ever seen or experiences a huge but quick wind like that? I swear it was like that wind which turned the boat on her side in the movie "White Squall" As we were heeling over--all I could think of was "we put back all the ballast with the rebuild--surely we don't need MORE?" and "maybe we should do some stability testing" I then realized that perhaps it wasn't the boat! "In one possible case of extreme weather, a resident of Point Loma suspected a water spout may have come on land and torn up a construction site on Garrison Street." Lots of trees down everywhere it seems. I lived in San Diego for 42 years and in Ocean Beach (On the other side of Point Loma, near the Bay) for 19. This is a really unusual storm. It hits harder because nobody expects something like this to happen. We've been in two waterspouts, and they are terrible. 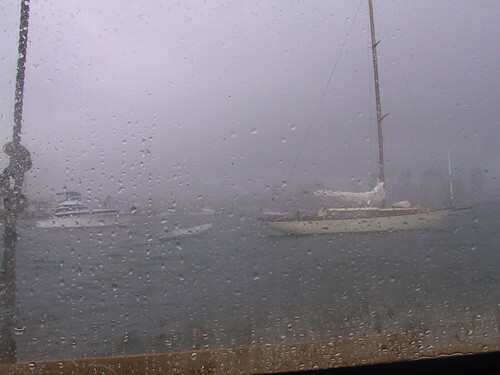 Incredible winds with driving rain, throwing an anchorage into total chaos. The first one was in the Bahamas the year we set out cruising, and most of the boats were spun around and about and they had to cut loose their dinghies or they would have been crushed as one boat swung into another one. The waterspout hit just before sunrise, catching most people still asleep. Because it happened in Nassau Harbor, we, and all the other boats (I assume) had out Bahamian moors, i.e. two anchors set 180* apart to handle the reversing of the tide twice a day. What a mess. A schooner anchored several hundred feet from us headed for us stern first as our stern was driven towards them. How neither boat sustained any significant damage from the collision is beyond me. It took Peter two hours of diving to retrieve our two anchors and rode (with the chaos of boats spinning around and hitting whatever boat was swinging the opposite direction we let the anchors go on floats and got away from all the other boat, then when the wind stopped we reanchored with our third anchor far away from everybody until things could get sorted out). The spinning around (and probably a bit of winding with the reversing currents twice a day), the anchor rodes were so badly twisted together they looked like one giant line. The wind and accompanying rain knocked out the hospital's x-ray department (I injured my hand during the worst of the storm and needed an x-ray - oops!). A lot of chaos. The second waterspout found us, 15 years later, in Kota Kinabalu, Borneo. We were on a mooring off a resort on a small island just outside KK. There's not much wind most of the time, so the wind that came up as we were sitting in the cockpit after dinner was a big surprise. The sun had set about an hour earlier, and our first warning was that the wind generator screamed frighteningly; fortunately it was easy to turn it around to stop the blades and then secure it. The wind was so violent that we were afraid that our sun canopy was going to take off. Peter threw line over the canopy to tie it down, but we still had to hold onto it for dear life while keeping our eyes out to be sure the mooring line held. By the time the wind and water ended (it's not rain, it is blowing horizontally, another challenge) we were exhausted. There was only one other boat in the bay, and they, too came through okay. However, they tried to get their sun canopy down and got hurt as the wind whipped it around. We took the ferry from the resort to Kota Kinabalu the next morning, and the damage there was significant. Ship containers lying all over the place, a bit like pick up sticks. At first I couldn't believe what I was seeing. The biggest problem both times was that the waterspouts touched down on the anchorages at night with no warning. They are violent with extreme winds. But they are over very quickly, so with well-set anchors or a good mooring the boat can come through without damage. The damage is to everything that isn't secured. Dinghies are airborne, canopies can shred, roller-furled headsails can come loose and flog themselves to shreds. Anybody who gets in the way of the wildly thrashing lines and canopies or sails can get hurt. It's a good reason to secure sails as soon as the boat is anchored, and keep decks clear of loose gear. You never know when a waterspout might descend upon you! Then again, twice in 15 years, not so often. But violent storms sweeping through an anchorage haven't been so rare, so good housekeeping habits are prudent all the time, since Murphy seems to be waiting for you to lower your guard. Thanks for sharing the water spout info. Everyone over several miles not just one place had the same experience so I cannot imagine it was a water spout--but yet it sounds the same as we experienced--instant onset of horizontal wind and water. I've not seen it come from the side like that. When David went forward to pull the canoe down out of the rigging (stuck about 5 ft above deck pushed by the wind and water against the mainmast and foremast shrouds) the boat had leveled but the horizontal water was keeping the canoe about 1/2 full of water. He said it was so weird to see that 6" of water inside the canoe held in mid air like it was magic. At the time, I was trying to see well enough to manage the engine/anchor chain tension. It was blinding. Realizing that the boat was laid over so far by just the windage of the bare poles--that was amazing. Before all the excitement, when the first boats started dragging I took a couple pics. This was all right before noon. The first one (Link to bigger pic here) makes me want to cry. It is a boat that the owner bought just 3 weeks ago to rebuild. He has been frantically working on it in these weeks. 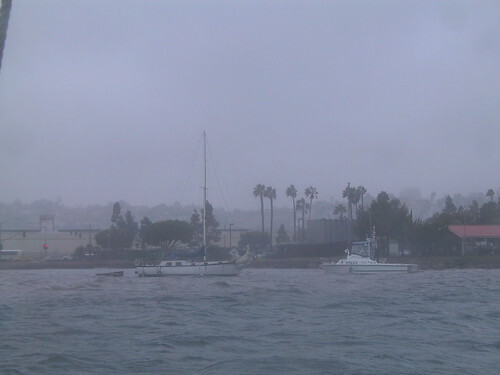 In the pic, you see the San Diego Harbor Police in front of him as he is being pushed by the wind onto the shore. Right before I took this pic, he was on the bow with a line to throw, begging them to take it. They would not. 20 minutes later, BoatUS Vessel Assist showed up and watched a power boat drag anchor into this one and then both go onto shore. It was so very sad to see two boats--the Vessel Assist tow boat and the Police boat both stand by and watch the boats go aground. The third pic is of the boat that, with the wind shift from S to W we ended up being 10 to 15 ft in front of. You can see the power boat that dragged anchor and two other boats that ended up on shore as well. Bigger pic here. It's possible that within that storm a few waterspouts formed, there certainly sounds as if there was enough energy there. So glad you made it through, and so sad to hear of the ones who weren't so fortunate. Others' misfortune tends to keep me sleepless for a few nights. A touch of survivor guilt, maybe? Yesterday we went ashore to run errands. As I'd mentioned our old analog wind meter stopped working around 60 knots during that wind shift from S to W. And unfortunately, we didn't have the airmar weatherstation wired in as David is working on the wiring for it. I though that winds were pretty much 40 knots or below following that shift. Well, the info I have from several boaters in the nearby mooring field comfirms that the shift pushed several knot meters up over 100 knots. But, the other interesting thing I learned was that for the 3 hours following the shift to W winds, the winds stayed ABOVE 40 knots and often close to 60 knots. I spoke with an employee at a nearby marina who said their meter stopped reading at 60 knots right before the wind shift and didn't actually read anything again until the next day. They thought it was broken. So, I thought we were in the high 20 knot range when we were in the 40+ knot range with gusts up to 60. Amazing how I underestimated the winds after that big event and with no functioning knotmeter. Strangely enough, experience ha shown that seamen (and here I include all catagories) always under-estimnate windstrength. A functioning annometer is not a luxury! On the other hand, experience also shows that passengers with no or very little experience at sea always over-estimate wind strength. Any theories on why this should be? What has this to do with cruising? Well, to be honest, very little but I thought it might be an interesting annecdote. Well that just figures--the more experience we get, the less accurate our observations will be! The very experienced skipper from a neighboring boat that went thru this gale with us just related the following: He's been through something like 30 storms with gale force or higher winds (as officially recorded by NOAA) most of which were in the past couple years of living aboard his boat on the hook in the Pacific Northwest. He's never seen anything as powerful as the storm we just experienced. He's never experienced anything like the blinding white-out that we had or the wind shear/cyclonic action which spun the boats around so quickly. All I know is that I'm really begin to think it's very funny that I can have such major "adventure" on this boat without even leaving the harbor! I guess wind speed estimation is based on our built-in fear-o-meter, and high winds are more frightening for the inexperienced ones. I may have related this tale before but if so it was long ago. I left school and went to sea as a cadet in 1971. Yes, I know, it was a long time ago but in August of that year my ship was in Hong Kong harbour lying at A2 buoy. This buoy was supposed to be a secure buoy to lie at during a typhoon. Anyone who was in the colony will remember taht in august of 1971 we were hit by one of the worst typhoons ever - super-typhoon Rose. On 16 August the Royal Observatory issued a typhoon warning. The ship's master decided to put to sea.When I heard this I thought that going to sea would be the worst thing to do - but I was still a very green cadet. Anyway, the slip wire was heaved to slacken the mooring cable which was then unshackled (we had a special mooring cable (anchor chain) on a centre gypsy on the windlass) and then the slip wire itself let go and the engine started. The ship sailed around Victoria island and, with the light at Wang Lan winking a departure signal, steamed out into the Taiwan Strait. Once clear of the land the sky darkened and the wind increased, slowly at first, until it was blowing seven bells out of Hell. Our barometer fell to about 955 millibars and, at worst, the ship experienced winds of about 100 knots. The rain was incredible too. To put it mildly, and this is probably the understatement of the year, a pretty rough time was had whilst the ship, hove to with the engines on slow ahead and the sea about 25 degrees on the bow, was continuously blown backwards by the storm. After the storm had passed we returned to Hong Kong and witnessed the devistation the typhoon had caused. At least 300 boats and ships sank or were badly damaged by the typhoon, killing 110 people and injuring 283. On land, the typhoon left over 5,000 people homeless, disabled communications and washed roads out. The Hong Kong-Macau ferry sank, which resulted in the deaths of 88 people and accounted for most of the 110 fatalities attributed to Rose. The USS REGULUS together with a number of other ships had been blown ashore. Buildings had collapsed and power was lost to much of Kowloon. The damage to my ship was little. An awning was blown away and some of the cargo shifted a bit resulting in a Rolls-Royce needing some serious pannel beating. We got off lightly thanks to a well found vessel and good seamanship. All in all it was a bad experience but it did serve as a lesson for me. I learned that to be aboard a well found ship at sea with adequate sea-room is, when things get really bad, better than to be lying at an anchorage. I sometimes think that I overdid the reading up and studying before we went cruising. A book that made a huge impression on me was "Heavy Weather Guide" by Kotsch and Henderson. One of the photos in that book haunted me for years, and with Stephen's posting about super typhoon Rose, a great deal of Kotsch's book came back to me. All the photos I found are this small, but there are more images regarding this storm's damage to US Navy ships. Typhoon damage 6 June 1945 The US Navy archives have a lot of information about such storms, their damage, and lessons learned from them. The point is that in the years between 1945 and 1971, and from 1971 to the present, weather reporting and forecasting has improved tremendously. Regardless, the casualties and damage from these terrific storms is enormous. If a storm can do that much damage to a warship, imagine the kind of damage that could be inflicted upon a little old sailing vessel. We can't always avoid them, but we can remain vigilant in order to prepare for them. And then one must rely upon our own experience and (sometimes) a bit of luck.